A man walks up the steps of the 9th U.S. Circuit Court of Appeals building in San Francisco, Feb. 9, 2017. A Senate Judiciary Committee confirmation hearing is set for Wednesday for Ryan Bounds, a federal prosecutor from Oregon nominated by President Donald Trump to fill a seat on the court. As President Donald Trump pursues his goal of making the federal judiciary more conservative, his fellow Republicans who control the Senate are poised to confirm another batch of his picks for influential U.S. appeals courts, to the dismay of some Democrats. A long-standing Senate tradition that gave senators clout over judicial nominees from their home states has been fraying for years, meaning Democrats have less of a chance of blocking appointees they oppose, as they did with some success during Republican former President George W. Bush's administration. One of those due for consideration on the Senate floor this week is Milwaukee lawyer Michael Brennan, who Trump has nominated for a vacant seat on the Chicago-based 7th U.S. Circuit Court of Appeals, which has jurisdiction over a region that includes Wisconsin. One of Wisconsin's two senators, Democrat Tammy Baldwin, opposes Brennan's confirmation. Another important test will come at a Senate Judiciary Committee confirmation hearing Wednesday for Ryan Bounds, a federal prosecutor from Oregon nominated by Trump to fill a seat on the San Francisco-based 9th U.S. Circuit Court of Appeals. 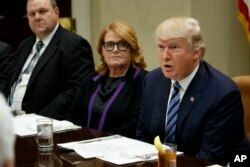 FILE - President Donald Trump speaks during a meeting with Senators on his Supreme Court Justice nominee Neil Gorsuch in the Roosevelt Room of the White House, Feb. 9, 2017. Oregon's two senators, both Democrats, oppose the nomination. Brennan, Bounds and other Trump nominees who may be opposed by home-state Democratic senators are likely to win confirmation because of the Republicans' 51-49 Senate majority. The appeals courts can set binding precedents on a broad array of issues, including voting rights, gun rights and other divisive social issues. For Trump and his party, setting aside a long-standing Senate tradition may be a worthwhile price to pay to achieve what Senate Majority Leader Mitch McConnell has called a top goal: shifting the ideological composition of the federal judiciary to the right. Leonard Leo, an outside adviser to Trump who has been instrumental on judicial nominations including Gorsuch's, said the White House has the same criteria for picking conservative nominees no matter the state. But Leo said, "You've got to engage a little more — in a more intense degree of consultation — with Democrats than with Republicans, so that takes a little time." The 2nd U.S. Court of Appeals in New York is seen in this undated photo. Hawaii's two Democratic senators back a Trump nominee to the 9th Circuit. The Senate's top Democrat, Chuck Schumer of New York, has so far held fire on Richard Sullivan, Trump's nominee to the New York-based 2nd U.S. Circuit Court of Appeals. Michigan's two Democratic senators voted in November to confirm Joan Larsen to the Cincinnati-based 6th U.S. Circuit Court of Appeals. Liberal activists doubt the White House is serious about compromise on judicial nominations. "Those few examples show that when Democratic home-state senators are consulted in good faith, they are not looking for progressive judges," said Christopher Kang, who worked on judicial nominations in Obama's White House. "They understand that President Trump is going to appoint conservative judges but they are willing to work in good faith to find consensus nominees," Kang added. There are 148 vacancies in the federal judiciary, with 68 pending nominees. Trump inherited a large number of vacancies in part because McConnell and his fellow Senate Republicans refused to confirm Obama's nominees to fill some of the jobs before he left office in January 2017, including Supreme Court nominee Merrick Garland.